When the novel was re-published after Sid’s death, Stan Barstow’s introduction described this passage as ‘infused with impending grief, yet such is its beauty the grief trembles on the brink of joy’. I’d like to thank you for coming to this ceremony of farewell and celebration. Holy Trinity has played an important part in the Chaplin story: Gillian was married here to David, Chris and I paraded the flag of the 15th Newcastle Scout Troop up this nave; and it was the setting for the funerals of both Rene’s father Andrew and our father. I hope you will join us afterwards for refreshments at the People’s Theatre, an institution revered and supported by Sid and Rene for many years. Champagne will be served at Rene’s specific request, made a few years ago after I’d investigated an almost forgotten life insurance policy, taken out in February 1940, when she was 20. When I mentioned the small death benefit, she said ‘Oh well, you can spend it on bubbly for my funeral’, threw back her head and laughed in girlish glee, partly at the non-conformity of the notion, mostly at the identity of the insurer: the Assurance Society of the Salvation Army. In that first year of war Rene was living in Ferryhill with her parents Andrew and Annie at 5 Wolseley Street, a smoky terrace of pit houses sloping down to the London-Newcastle railway line and Mainsforth Colliery, where the year before my grandfather had lost his left arm in a rather terrifying accident. The following months were difficult, and Rene, who worked at Stapleton’s store, helped her mother supplement the family income by baking to order – pies, tarts, scones and cakes. As we’ve heard, Rene was good at pastry. Then came the event that shaped her life. One Sunday evening she went to the Methodist chapel in the nearby village of Kirk Merrington and listened to a young lay-preacher and pitman. She thought he was rather too pleased with himself, but a few weeks later on a chapel picnic found herself walking beside him. Rather shyly, he asked her out and she responded by slapping his face. If this seems harsh, she mistakenly thought Sid was already going out with a girl called Sadie. But oh that fateful slap! The great story yet to unfold was almost snuffed out before it began and the people down here would never have existed. But Sid persisted and Rene relented, and things went on from there. She listened as he spoke of the stories in his head and his dream of becoming a writer. She came to adore her man, and he returned it, knowing full well that everything he wrote, everything he did, would not have been possible without her. After they married, Rene never worked outside their comfortable and welcoming home. Just as her father hadn’t quite seen the point of allowing his intelligent daughter to stay on at school, her husband was reluctant to have a working wife. Rene accepted this – and committed herself to their joint project, whatever it took, through thick and thin. Her support went way beyond the domestic: my father wrote like an angel, but was sensitive, sometimes prone to self-doubt. As well as being – his phrase – ‘my first and most unerring critic’, I believe Rene gave him the confidence necessary to make the journey from self-educated colliery belt-fitter to revered man of letters. She stiffened his sinews, by his side to celebrate the good days, and nurture him on the bad. On his death, her greatest grief was simply that when he went, she was not there with him. The story is typical. Rene had in abundance what we now call emotional intelligence; more plainly, she was brilliant with people, of all ages. Her talk was always vivid, confirming her English teacher’s report comment that ‘Irene’s oral work is very good’, but she was just as good at listening. She was in the best sense curious, like the poet Les Murray, ‘only interested in everything’, her opening remark likely to be ‘What’s the news?’ She drew her rather wry wisdom from a life packed with experiences, good and bad, and gently comforted her friends when they needed it. Among her many other gifts was an almost photographic memory: of every branch, twig and leaf of not one but two statuesque family trees; the lay-out of Tolstoy’s study, imprinted during the moments when her awestruck husband sat at his hero’s desk; productions seen at Stratford East in the 1950’s; what LS Lowry wore when she first met him, evidently a good top coat and pair of stout boots, which she cannily explained after a moment’s thought: ‘Well, you see, he’d been a rent collector most of his life.’ It seems to me Rene forgot nothing but underneath her sharpness had the forbearance to forgive just about everything. Three months ago I went to the RVI the night she was admitted in pain for surgery on her broken hip. Gillian and Chris had been with her, but I did the late shift. Rene lay asleep on a trolley in a corridor, but eventually came around. She could barely see me but smiled. She knew this was the beginning of the end, but was unafraid, serene in fact. She said that when she couldn’t sleep, she lay in the darkness thinking. I asked what she thought about, and for the umpteenth time was quietly amazed by her reply: she pondered all the wonderful things that life had given her – her husband’s love, her bairns and grandbairns, that golden night when she and Sid ate bacon sandwiches and read glowing reviews of The Day of the Sardine. Oh Michael, she crooned: ‘And the time I came to visit you and Susan in New York and I stood on the top of the Empire State Building.’ Before she fell asleep she clutched my hand: ‘Tell them I love them all very much.’ So this is how I think of her: in the Arrivals Hall at JFK that December night in 1999, suitcase in hand, in tweed coat and pillbox hat, smiling her impish smile – this plucky, pint-sized traveller through life. But what of those left behind? It’s hard to imagine life without her. The rock that is family seems cracked. Where’s the centre of gravity now? Two courses of action: to remember the wisdom of my grand-daughter Eve who wrote to me, ‘If you feel sad, then think of something nice.’ Second, to look down here at Rene’s five grandchildren and partners, who like her are substantial people – smart, resourceful, hard-working, loving, with sense of humour and moral compass. 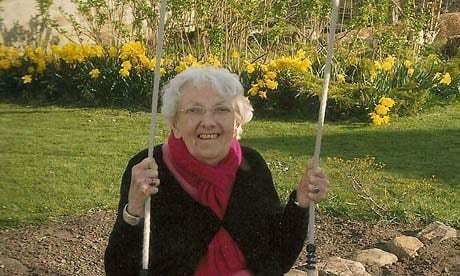 Then there are her nine special great-grandchildren – the cause of this smile (on the order of service), for on that sunny Easter day in Coquetdale she was surrounded by them. All this explains why I mentioned that paragraph of Sid’s, and Stan Barstow’s response to it, for what I feel now is of course grief, but given Rene’s remarkable life, character and legacy, a grief that trembles on the brink of joy. Bless you, my friend. Thank you, Mother.